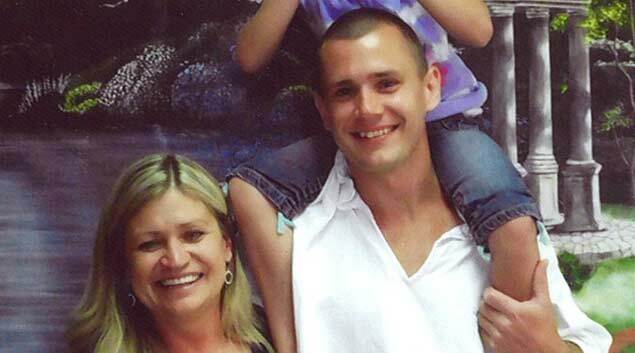 Tonya Finley, of Hugo, poses for a photo at a Texas prison with her son, Shawn Ragan, an offender at the prison. Ragan's two daughters make the trek to visit him once a month. At least 1,800 children in Oklahoma have parents incarcerated outside of Oklahoma. Finley takes her granddaughters to see their father once a month at H. H. Coffield Unit in Tennessee Colony, Texas, where he's housed for an aggravated robbery conviction. Tonya Finley has been taking her granddaughters to see their father often enough that the prison guards know them. “Savannah will go up to them and ask, ‘Will you please let my daddy come home?’ and, they’ll go ‘We’re just about to,’” Finley said. At the first of every month, Finley and her granddaughters Alissa, 9, and Savannah, 6, leave their home in Hugo at 4 a.m. to visit the girls’ father and Finley’s son, Shawn Ragan, at a correctional facility in Tennessee Colony, Texas, about 170 miles south of Hugo. Ragan, 28, was convicted of aggravated robbery in 2006 and was sentenced to 25 years in prison. He was arrested in 2005 after he used a broken beer bottle to rob an elderly couple while at a lake, according to court records. Now, his children Alissa and Savannah are part of a population of at least 1,800 children in Oklahoma with parents incarcerated outside of the state. Little was known about this group of children until recently when the Children of Incarcerated Parents Task Force collected the data in cooperation with Angel Tree, a prison fellowship program. Finley has noticed a behavioral cycle with her granddaughters that centered around their prison visits. After the girls spend time with their father at the prison, they appear calmer and happier. But as the month goes on, they’ll start to act out and get depressed. “After they go see him, and he sits with them and rocks them and talks to them, on the way home, they’re two completely different kids,” Finley said.Imprisonment of fathers is likely to disrupt a child’s home, with most of their children losing financial support and many losing an important source of nurturing, according to the Oklahoma Institute for Child Advocacy. Child advocates and experts report that children of incarcerated parents run a higher risk of going to prison themselves and also are more likely to live below the poverty line. Additionally, Oklahoma has the highest female incarceration rate in the nation and is generally in the top five in incarcerating men. The Children of Incarcerated Parents Task Force was created this year through legislation to find out more about where children of incarcerated parents were located in Oklahoma. Smith, Oklahoma Commission on Children and Youth director, said these children face different obstacles than children of Oklahoma offenders. For one, the distance between the parents and children makes visitation a challenge, she said. Additionally, phone calls to prison can come at the high cost to the families. The task force hasn’t yet made recommendations about how to best serve this particular group of children because the data was only released in October, Smith said. The task force has also collected data for one of the first times about male offenders with children. From data collected from 1,363 male offenders at eight prison facilities, researchers created estimates to represent how many children the entire male offender population had. The Oklahoma Department of Corrections asks offenders when they’re first entering into the system whether they have children, but the offenders often aren’t upfront about whether they’re parents for fear of state intervention with their children. Researchers on the task force asked corrections officials to draw a sample of 2,000 offenders arranged by race, age and security level and tried to make the sample representative of the overall population, according to task force data. Based on the data, an estimated 21,482 minor children have a father in prison in the Oklahoma Department of Corrections. Of those children, an estimated 10,204 children were living with the father in the six months prior to his arrest. An estimated 4,750 children with incarcerated fathers are under the age of 6; 6,932 between 6 and 12 years old; and 4,985 ages 13 to 18. In some cases, the surveyed offender did not report an age for a child or children. Additionally, at estimated 4,624 minor children in Oklahoma have an incarcerated mother, and about 2,430 were living with their mother at the time of her arrest. Many people coming through the criminal justice system in Tulsa County are parents, said Tim Harris, Tulsa County district attorney. Harris said he was sorry that children were affected by their parents’ crimes, but the fact that someone is a mother or father doesn’t weigh heavily on him when deciding a punishment or restitution. One reason the Rev. Stan Basler wanted to serve on the Children of Incarcerated Parents Task Force was to help recommend how to provide better outreach for incarcerated fathers and their children. Ragan has told Finley several times that she’s his lifeline. Finley said while in prison, Ragan has taken college courses and has received his plumber’s license and air conditioning and heating license. Ideas for how to improve the father-child bond are among the recommendations that the Children of Incarcerated Parents Task Force will make to the Oklahoma State Legislature. Basler said many incarcerated fathers don’t mention their children because they owe child support and don’t understand how to apply for a reduction in payments while incarcerated. The next task force meeting is Friday at 10 a.m. at the Oklahoma Commission on Children and Youth offices in Oklahoma City.